Agile Project Management (AgilePM®) is well established as the leading framework and certification for agile project management. It combines flexibility with proven success for successful agile project delivery and increasing numbers of organisations are embracing its tools and frameworks. Key benefits often attributed to Agile include improved revenue and speed to market, developing the right product/solution (through iterative development and incremental delivery) and increased collaboration, customer satisfaction and return on investment from projects and other change initiatives. Based on the proven fundamentals within the DSDM Agile Project Framework, the certification provides the ability to deliver Agile Projects in organisations requiring standards, rigour and visibility around project management, while at the same time enabling the fast pace, change and empowerment provided by Agile. Successful completion of the Agile Project Management (AgilePM®) Foundation & Practitioner examinations leads to certification as a Registered AgilePM® Practitioner. Our highly regarded Practitioner and Integrated courses are structured so that the Practitioner exam is taken in the classroom directly after the training element (as per Foundation but at the end of the week). We prefer this approach to the post course online exam booking system as it ensures that the course content is fresh in the mind and enables delegates to leave having completed both the course and examination. You can book a place on this website using a credit or debit card, or you can call us on 0117 949 1500 to make a provisional course booking and be invoiced (paying via Internet banking / BACS). This course and qualification are aimed at senior managers currently or prospectively undertaking project roles or those wishing to gain formal qualifications following previous project experience. The methodology integrates well with the various methodologies of project management such as PRINCE2®. Anyone wishing to move upwards into other roles, say, in Programme Management would benefit from an understanding of Agile. It can also be useful for anyone in engineering and information technology development for software projects and product or application development. 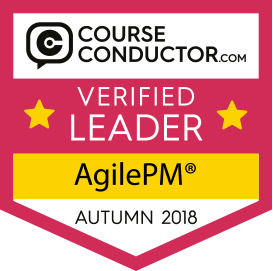 AgilePM® can improve your understanding of different management styles needed for successful agile projects compared to traditional projects, this will allow you to tailor your approach to different situations and adapt to a changing business environment. Traditional Project Management is based on the idea that companies have a long time before bringing out new products, and any product will generate revenue for many years. For many industries the traditional model no longer applies, where companies now have to bring new products to market quickly, and expect to constantly refine the product or innovate in order to retain market share. Companies use Agile techniques to help meet this challenge successfully. The Foundation examination involves 2 days of formal instruction (Mon–Tues). A further 1.5 days of formal instruction is required for the Practitioner examination (Weds / Thurs). The exam is on Thursday afternoon (usually 2pm). Delegates must have achieved a 50% pass in the Foundation exam to be eligible to sit the Practitioner exam. In total there are 4 days of formal instruction and the Foundation and Practitioner examinations (Mon - Thu) delivers a comprehensive understanding of the principles and theory of Agile Project Management. The Foundation & Practitioner Integrated course fee includes the cost of the Foundation and Practitioner examinations and also the official APMG/DSDM manual. During this four-day course our highly experienced instructors will walk you through the AgilePM® using a stimulating combination of lectures, demonstrations and tutorial exercises all of which are bound together by relevant Agile themes. A pre-course study pack is sent out by email upon receipt of payment. This represents approximately 12hrs work in the form of exercises and reading. The textbook is provided on day one of the course. Create a digital badge for your social media profiles - click here for details. For delegates wanting to take Agile Project Management™ (AgilePM®) as part of the Success Series, ‘Success in Agile Project Management (AgilePM®)’ should be booked. Our Success Series gives our delegates the option to work towards a CMI Level 7 (MBA-level) Award at no additional cost to the chosen qualification. All delegates using ELC funding should note that if they select this option, they are required to attempt the Level 7 Award, which involves an element of additional independent study and completion of one assignment of c. 3,500 words, in order to satisfy ELCAS that they have completed the course.